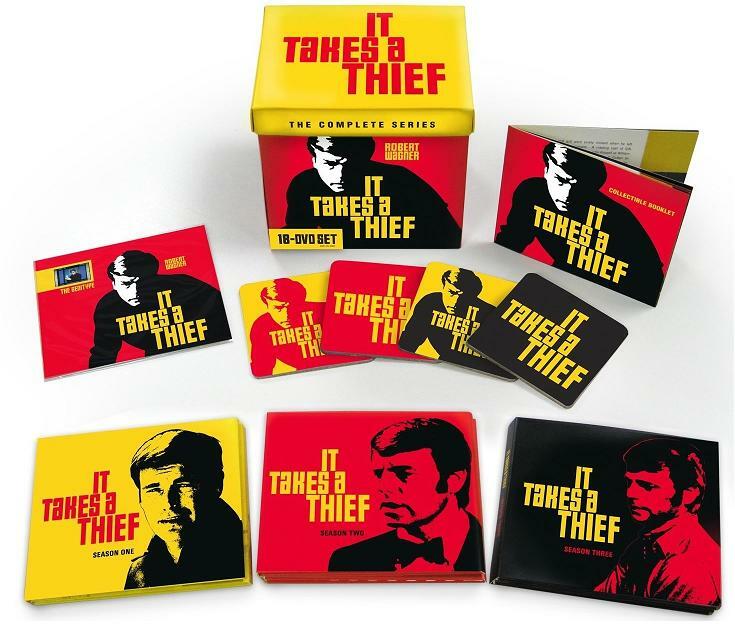 Challenge: Entertainment One was planning to re-release “It Takes a Thief”, a favorite spy television show from the sixties, and was looking for a way to refresh the classic series for contemporary markets. The company decided to sell the complete television series on a set of DVDs in an effort to modernize the iconic show in order to rekindle original fans and attract younger audiences as well. To incentivize customers to purchase the disc set, they revamped the graphics with bold colors and cutouts and were looking to include a promotional gift-with-purchase to sweeten the deal for consumers. Solution: The client approached ePromos Account Executive Caren Aardema with the idea of including a custom coaster with the DVDs – a useful and relevant promotional giveaway considering the fact that it could be used while the customer watched the DVD in their home. The client initially inquired about a single coaster with a basic one color imprint, however, Aardema utilized her industry experience to locate a factory with custom capabilities who could produce an entire set of the coasters plus unique packaging that coordinated with the rest of the disc set. Not only was the complete set less expensive than some of eOne’s original suggestions, but the factory was also very close to the client’s distribution point, which saved the client money on freight costs and provided additional time for the custom design process. Result: The coaster sets were completed and delivered well in advance of the release of the DVD sets. Within weeks of the initial release a second batch was scheduled for production! Consumers have responded positively to the free gift and sales of the collector’s set have exceeded expectations. This nifty guerrilla promotion comes to us all the way from India. To promote a TV series about a cunning crime-solving couple (Mr. and Mrs. Mishra), custom bookmarks were placed in the middle of mystery novels at various bookstores. Customers who were already on the lookout for some good mystery fiction were the ones on the receiving end of this promotion, so the campaign’s targeting was right on-point. Use this as a guiding example the next time you’re trying to find and distribute a promotional product that is guaranteed to reach your niche audience! My friend got her hands on this promotional cup at a showing of Wicked on Broadway the other day. Although drinks cost a pretty penny at plays in New York City, at least you get a nice souvenir cup out of the deal. Right now she’s using it as her daily coffee mug, which is a nice testament to the branding power promotional products. Promotional t-shirts have been used to promote countless movies, but what about promotional t-shirts for fictional businesses and organizations that were featured in movies? Well, now you can buy them. A great idea that pretty much had to happen someday, Last Exit to Nowhere sells a variety of t-shirts promoting fictional businesses from your favorite movies. Many years ago I shared an apartment with several other young people and one of them was an unpaid intern at a jazz record label. I was a little older than him, and had already developed a taste for paid work, but I still remember sitting on the couch while he described how awesome his unpaid internship was. It ended with “and they gave me this shirt!” (as he pointed at the shirt he was wearing). If only a free shirt could make me as happy as what’s-his-face. Anyhow, free stuff makes everybody happy, and below are some promos that fans like my old roommate collected at the SXSW music festival and at Amoeba Music on Record Store Day.